Fall has finally arrived in St. Louis. 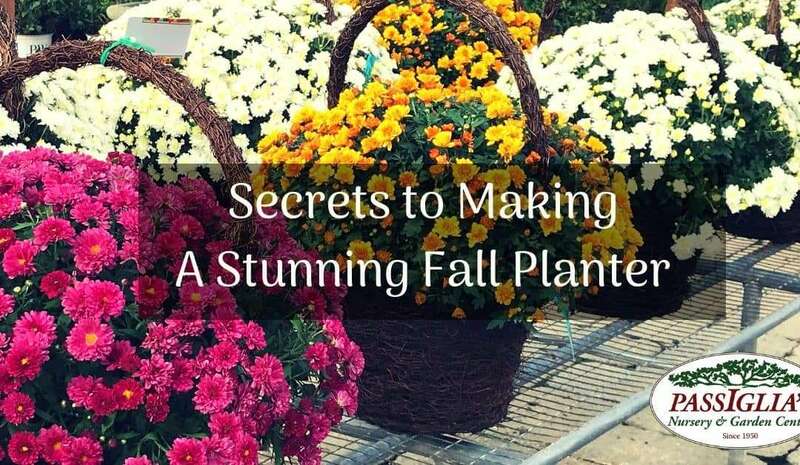 Many of our customers are wondering the best way to make a fall planter for their porch or patio. We asked Julie, our expert, to share the secrets behind the planters she creates for our Nursery that fly off the shelves. Don’t feel confined to “fall” colors. We combine pink, purple and white flowers with traditional fall-colored flowers in red, burgundy and orange to make our containers more interesting. Always add three types of plants; a filler, a spiller and a thriller. Pick larger plants than you would in the Spring. The fall gardening season is short and they won’t have as much time to fill up the planter. The thriller should be 2/3rds the height of the container. Squeeze the root ball as you place the plants in the container so you can pack the plants in tightly. Add soil as you go.